As the two young girls sat together in silence, something in each, something virginal, childish and remote, found response in the other, and, without words, the young barbarian and the product of a fastidious civilisation became friends, as children become friends, suddenly, with tacit recognition. observations: Should be read in conjunction with earlier entry. Noel, an Oxford undergraduate, ends up persuading her cousin to come back to London and try again with her husband. It’s not clear if this is a good thing or not, and there’s a way in which the book is maddeningly indecisive. The key to Denham’s philosophy is ‘It’s such rot... doing things we don’t like doing because someone else does them.’ She is of course completely selfish and uncomprehending, but her view of life is interesting. There are some very funny bits: Denham tells her RC fiancé: ‘Being Church of England saved a lot of trouble, because there was no English church in Andorra’ [where she grew up]. The book suggests making the spare room ‘as repulsive as possible, in order to spite visitors from coming to stay.’ The intellectuals in the book all enjoy crosswords and parlour games – Denham’s complete horror at this is very amusing. What she enjoys is going to the Zoo, and motorcycling, and hanging around on the beach with her dog. Overall I am very glad I read the book, and grateful to Leaves and Pages for finding and recommending it. My good friend Margot Kinberg of the Confessions of a Mystery Novelist blog pointed out to me (after reading the entry earlier this week) that Crewe Train is one of the books on the victim's bookshelf in Agatha Christie's Murder in Mesopotamia: a solid gold piece of trivia, thanks Margot. Hercule Poirot concludes that the list shows that the owner is 'not a fool... she had a mind.' He tells us that each book reflects some aspect of the victim (though it won't solve the crime for you), Crewe Train because of its picture of an independent individualist. 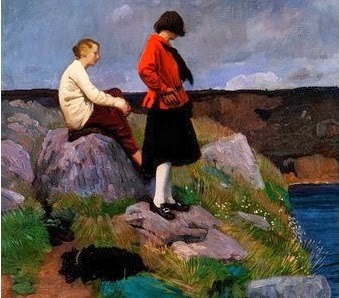 The picture – which really made me construct this entire blog entry because it looked so much like my image of Noel and Denham – is by Dame Laura Knight. It’s called The Cornish Coast, and was painted a few years before the book was published. There's another Rose Macaulay in two voices, one a purveyor of chick lit, one telling it like it is. Title??? Oh that sounds good, don't know it at all, and she wrote such a lot it's hard to track down. If you remember/find out, then tell me. Moira - Thank you for the kind mention. And your post really does show more of Denham's personality. The more insights you give about this book, the more sense it makes to me that someone like the victim in Murder in Mesopotamia would have it. And I do like that touch of wit. Sounds like a story of how two worlds collide or how one person gets put in world that they don't belong in... and adapts? Could be interesting. Clearly I know nothing about this author. Maybe I will try this book or another of hers someday. I think I'll stick to my 15 unread Freemantles! Did you hear that? Just got louder when I read that.